The Imperial Humbucker captures the airy top end, balanced mid-range, tight lows, and complex overtones of the classic original PAF pickups. Lollar then improved on the design to give you a more balanced frequency response. 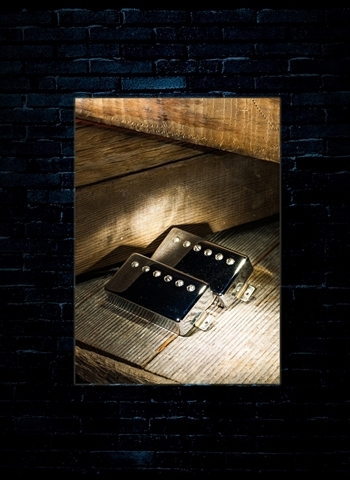 Its medium output is in the vintage range with a hotter wound bridge pickup compared with a typical vintage set. The unbalanced coils produce a tight bottom end that complements the pickup's fullness and causes overtones to build after each note is played. Overall, it has a fuller bridge tone and a cleaner and brighter middle position. The neck is hot enough to play on the edge of amp distortion, or you can adjust your picking pressure to achieve a cleaner or dirtier sound as desired. Made with Alnico 2 magnets in the neck and Alnico 5 magnets in the bridge that are degaussed to specific levels unique to the neck and bridge positions. Covers are nickel silver. Sold as singles or as sets, and comes in a wide range of cover options. Single conductor braided shield lead wire and 4 conductor lead wire is available.